Vacuoles are usually large compartments that in mature cells may be up to 90 % of the total cell volume (Figures 1 and 2). They are the largest compartment of plant cells. 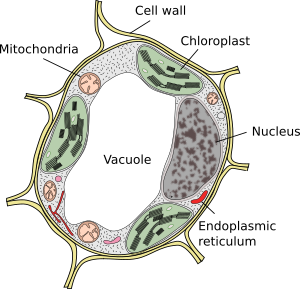 The name vacuole is derived from the Latin word "vacuus", which means empty. This was clearly a misunderstanding because vacuoles are not empty, but filled with a more or less concentrated aqueous solution. The membrane of the vacuole is known as tonoplast, and it is an essential part for the function of this organelle. In plants, there are several types of vacuoles according to the role they carry out. A plant cell may contain different types of vacuoles, and a vacuole can modify its enzyme repertory and then change its function. Figure 2. Photosynthetic parenchyma cells of Ulex europaeus (images on the right and on top). Vacuoles are the clear spaces. Nucleus and chloroplasts can be observed. 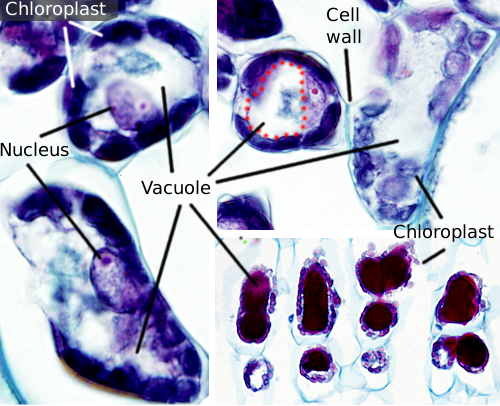 The image on the bottom comes from photosynthetic parenchyma of a pine leaf showing vacuoles stained in purple.